I’m excited! 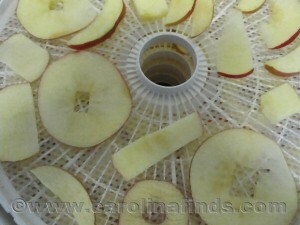 I The new food dehydrator I ordered has arrived and have my first batch of apples and bananas drying. I had a dehydrator in the 1980’s which got a lot of use. It didn’t have temperature control but did have ten trays. Unfortunately, after having it for around ten years, a recall was issued. The “replacement” I was sent was a joke. Had I known I would have kept the old one in spite of the recall. After all, I’d used the dang thing a lot for ten years with no problems. The “replacement” couldn’t compare. It only had four trays and if I remember correctly, it wasn’t as powerful, either. The bottom of the trays was terribly flimsy, seemed to be made of a cheap plastic. In fact, the entire thing wasn’t near the quality of the one it was meant to replace. I used it several times but ended up throwing it out. From what I can tell so far, I’ll be pleased with my new one- it’s very similar to the old one I enjoyed so much but with a thermostat. It’s a Nesco American Harvest FD-1018 P. (Gardenmaster). It came with eight trays, eight fruit leather sheets, and eight clean screens but can take up to thirty trays. With each tray holding a square foot, that is a lot of drying room! The only difference between this one and the FD-1010; the FD- 1010 only comes with four trays. The FD-1018 is a ‘package deal’, and in my opinion offers the most bang for your buck. I debated with myself about purchasing the FD-1020. It has the heater and fan located on top, which could be nice if one dehydrates a lot of drippy things, but I didn’t want digital controls. Anyway, I can always leave the bottom tray empty and place a fruit roll-up sheet on it to catch any drips. Stay tuned! I play to do a more in-depth review of my new toy after I use it for little while and hope to share some recipes with everyone as I experiment as well.